5.1. Authority to lay moorings - No person shall place, lay down, maintain or use any mooring or pontoon, (including one placed, laid or used before the commencement of these Directions), in the Harbour without a written licence granted by the Commissioners. 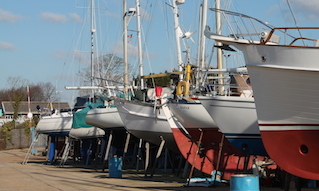 The placing, laying down, maintenance or use of any agreed mooring by the Commissioners shall be in compliance with the conditions attached to that licence. In the absence of such licence or if conditions attached thereto are not complied with any such mooring shall be forthwith removed by the owner thereof if the Commissioners so require. 5.2. 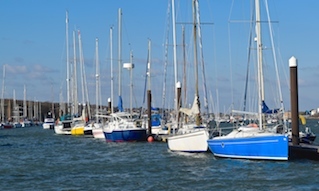 Responsibility to securely moor - The Master of a vessel remaining at a mooring within the Harbour shall cause it to be properly and effectively moored, such that it is not only secure but also is not liable to cause any damage to any other vessel or property (including any pontoon, mooring or quay). 5.3. Moor as directed - The Master of a vessel on entering the Harbour shall if directed to a mooring by the Harbour Master proceed to the mooring to which he is directed. He shall not move to a different mooring without the express permission of the Harbour Master. 5.4. Manning when anchored or moored - When conditions require or in any event when required by the Harbour Master, the Master of a vessel shall cause at least one competent person to be on board at all times whilst the vessel is anchored or moored in the harbour. 5.5. Rafting - In areas of the Harbour where the Harbour Master requires vessels to raft together, Masters must follow the Harbour Master’s instruction to raft. Save as aforesaid, no Master shall make his vessel fast to any other vessel without the permission of the Master of such other vessel unless instructed to do so by the Harbour Master. 5.6. Anchoring - A Master shall not anchor his vessel, except in the case of an emergency, in the fairway, any other areas prohibited for anchoring, or areas designated as small craft mooring areas, or where they are likely to obstruct navigation. Anchored vessels are liable to pay harbour dues. 5.7. Lost anchor - If any vessel laying within the Harbour parts from its anchor, the Master of the vessel shall report the fact, including the position of the lost anchor forthwith to the Harbour Master. 5.8. Fouled anchor - If at any time the anchor hooks any mooring in the Harbour, the Master of the vessel shall not proceed to clear the same, but shall as soon as possible advise the Harbour Master in order that the Harbour Master may provide aid in clearing the mooring without the sustaining of any damage to the mooring. Any damage caused by the Master in clearing his anchor from a mooring without, or prior to, notification to the Harbour Master will be the sole responsibility of the Master. 5.9. Obstruction of Aids to Navigation - The Master shall not permit his vessel to obstruct or be attached to any aid to navigation including light, beacon, sea mark, navigation buoy or mark, racing buoy or tide pole within the harbour. 5.10.4. But, except in an emergency, no entry shall be made under this article without reasonable notice first having been given to the owner or the person appearing to have charge of the vessel. 5.11. 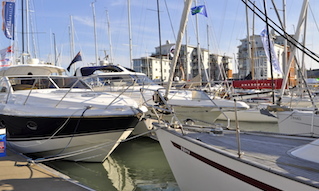 Public Landings - No Master or person shall use or permit his vessel or equipment or other items to obstruct any public landing place, hard, pier, jetty, slipway or training facility within the Harbour. 5.12. Fuelling Berths - No naked flames of any sort are allowed at the fuelling berths, fuelling facilities, fuelling pontoons, or the fuel tank storage area. Smoking and the use of mobile phones or any other portable electrical or electronic devices are prohibited in these areas. 5.13. Noise - Except in the interests of safe and proper navigation no musical instrument, radio, television, amplification equipment, computer, loudspeaker, gong, horn, bell, engine or generator shall be used in a manner which causes nuisance of others. 5.14. Offensive fumes or smoke - The Master of any vessel within the Harbour having on board any offensive goods, including anything giving off a smell, fumes or smoke which may cause nuisance to other Harbour users, shall so far as is practicable limit the effect on others. If required following instruction from the Harbour Master the Master shall remove the vessel and/or the cause of the smell, fumes or smoke from the Harbour and the Commissioners’ property. 5.15. Open Fires on board a vessel - Notwithstanding the contents of 5.14 the Master of a vessel at any location within the Harbour shall not allow any fires, except for gas cookers or barbecues designed for the purpose. Such permitted fires shall be used on-board the vessel only and not transferred to a pontoon. 5.16.1. Oil or oily residues/discharge. 5.16.2. 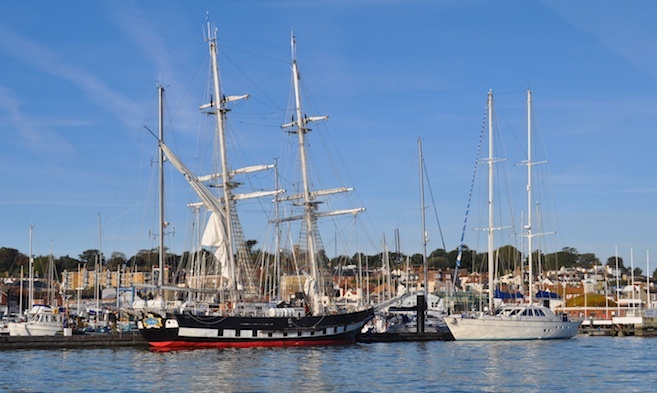 Sewage or other pollutant materials into Cowes Harbour when moored within or alongside marina mooring facilities or alongside pontoon berths having direct pedestrian access to the shore. 5.16.3. Garbage, plastics, or foodstuffs, except into designated receptacles ashore. 5.17.3. In respect of a vessel carrying more than twelve passengers the owner/operator holds a current licence for that vessel issued by the appropriate national authority (e.g. Maritime and Coastguard Agency) and the Master holds the necessary licence granted by the appropriate national authority (e.g. Maritime and Coastguard Agency). 5.17.4. The Commission reserve the right to inspect any vessel used for the carriage of fare paying passengers to satisfy itself that the vessel is being operated in accordance with the relevant licences. The relevant licences shall be presented to the Commission upon request. 5.18. 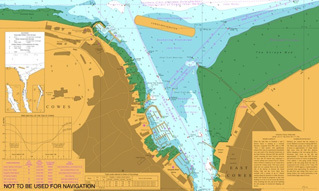 Use of navigation buoys as race marks - The use of Inner Fairway navigation buoys, small craft channel buoys and beacons as race marks is prohibited without the written permission of the Harbour Master. 5.19. Tampering with Equipment - No person shall without lawful authority displace or tamper with any safety or fire equipment within the harbour except in the event of an emergency.